Typically overseeing the operations of the Daycare Centre, these directors have many more tasks added to the job description such as – ensuring that the little kids are given proper care, making sure that the daycare facility is in a safe and happy environment, developing and programming curriculum, drafting learning plans, supervising staff, hiring and interviewing teachers and employees, maintaining stock of supplies and checking safety equipment functioning, setting and maintaining operational budget, overseeing accounts receivable and accounts payable, attracting prospective clients and communicating actively with parents regarding their wards progress. Some of the core job skills that are listed in the Daycare Director Resume are business management skill, classroom experience, knowledge of safety regulations and the ability to use all types of first aid and safety equipment, good understanding of child development and up-to-date knowledge of various educational methods. A college degree preferably in early childhood education is common among daycare directors. Summary : Devoted and talented teaching professional that has been blessed with the gift to reach each child and instill a love for learning. Dedicated and enthusiastic Childcare Director with considerable experience managing both children and small/large teaching staff. I have extensive experience in training, teaching, promoting, supporting and empowering teachers. For many years I have worked with very diverse families both at the center and home environment. Skills : Classroom Teaching Experience, Literacy Coaching Experience, Education Director Experience. Consulted, designed and opened a new childcare center including all hiring and training. Established center policies and communicated them to staff and families. Maintained all records and met all licensing requirements including budget payroll. Implemented and used ts gold in every classroom to evaluate children's portfolios to achieve the rating. Hired, supervised, trained and mentored staff to ensure high-quality care and education in all classrooms including actions plans and classroom monitoring of lesson plans. Communicated with families and engaged them in school activities and training. Developed monthly age-appropriate curriculum and lesson plans for center. Maintained records and had ongoing positive communication between parents administration and faculty. Planned and implemented age appropriated lesson plans for kindergarten prep. 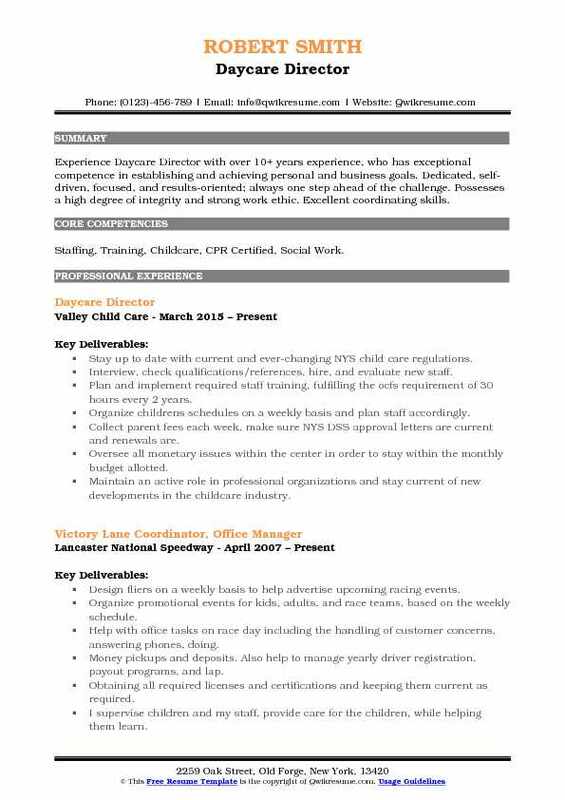 Summary : Friendly, energetic and experienced Childcare provider/Director with over 35 years in the childcare industry. Able to manage both a large staff and large groups of children. Communicated with parents, caregivers and administration to consistently provide highest quality childcare. Skills : First Aid And CPR Certified, Loves Children, Infant and Child CPR Certification, Dependable, MS Office Proficient, Self-sufficient, Time Management, Detail-oriented, Adept at Working With Special Needs Children, Calm Under Pressure. Managed, observed and evaluated employees of the center and in charge of hiring and firing of staff. Complied with all company safety standards, policies and procedures for staff. Created policy and procedures, job descriptions and the daycare handbook. Planned all daycare activities including fund-raisers and all holiday celebrations. Communicated with parents through enrollment, tours, newsletters, conferences and direct personnel. Parents informed on a regular basis to discuss the development of their children. Did inventory, billing, ordering, and purchasing of supplies and materials. Ensured the center and staff followed all federal, state, and local rules, regulations and licensing requirements. 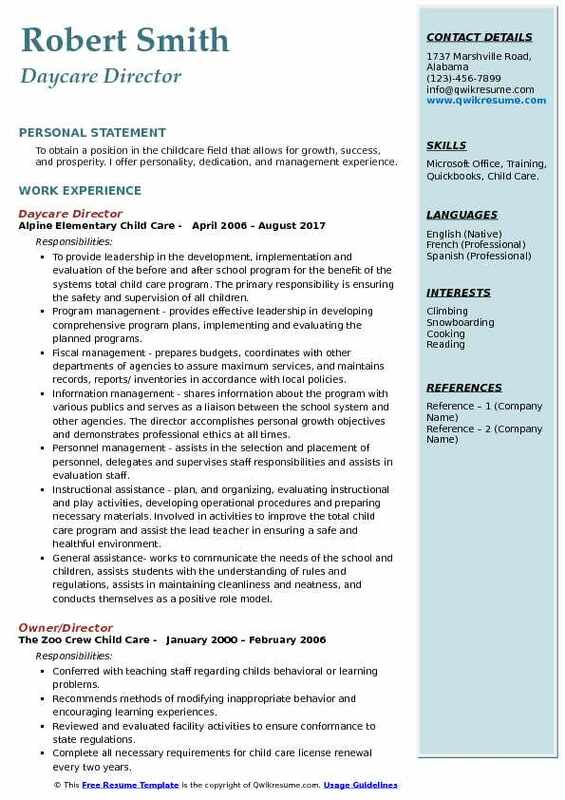 Summary : To obtain a management job as a Daycare Director in a field that allows me to build relationships, set, accomplish, and even exceed goals all while making others feel successful and confident in their daily lives. Direct a Mon - Fri, 6am - 6pm daycare with an average attendance of 115 kids. Create pos and check request for all accounts and payments to each as needed. In charge of a staff of 25 people, some full-time and most part-time. Create, plan and execute several programs each year. Open house, Thanksgiving dinner, Christmas program, grandparents breakfast, and graduation. Weekly invoice families, monthly invoice Missouri state daycare sub, and ecp scholarship. Experience with payments in cash, check, credit card and online. Daily deposit to the bank. Hold parent conferences to discuss concerns regarding their child. Make goals and see them implemented in the classrooms. Work with parents as teachers, every child promise, sps early childhood spec ed, and other agencies to make sure that all children are receiving the educational help that there is to offer in Springfield. Summary : Reliable child care center director talented at creating and managing a safe, stimulating environment for children ages newborn - 12 years. Expertly leads a team of 30+ teachers with a focus on fostering independence and team strength. Delivers consistent positive energy to families. Reliable, empathetic, motivated, and responsible. Ensures safety, stability, and compliance within any position. 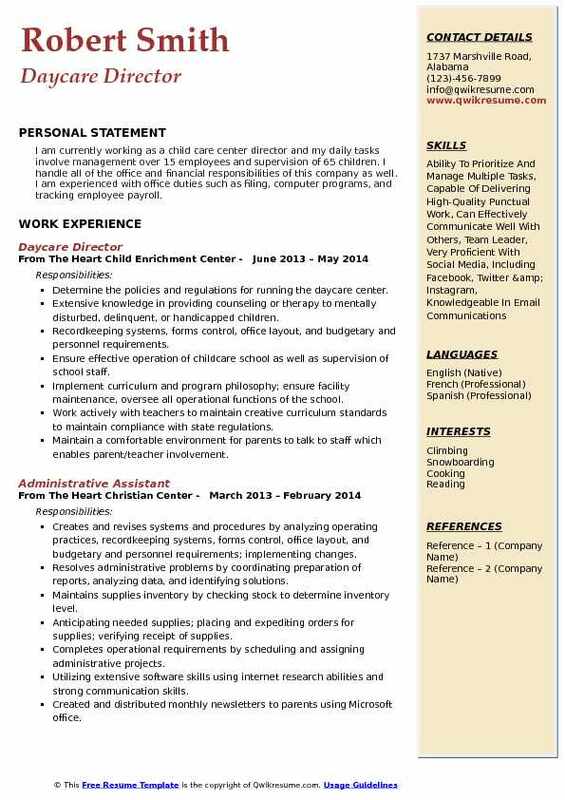 Skills : Child Care Professional, Facility Management, Budget Control, Event Planning. Minister to parents and children enrolled making sure their needs is met to the best of our abilities. Work with business administrator and cdp committee on an ongoing basis to be sure that we are meeting the needs of the community, our daycare families and our staff. Work with preschool ministry and esl childcare to make sure that they have what they need as we share space and supplies. 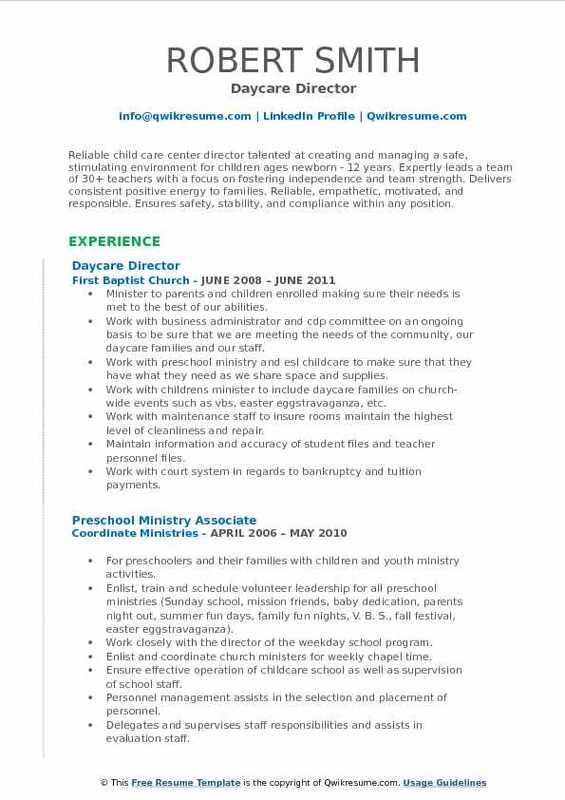 Work with childrens minister to include daycare families on church-wide events such as vbs, easter eggstravaganza, etc. Work with maintenance staff to insure rooms maintain the highest level of cleanliness and repair. Maintain information and accuracy of student files and teacher personnel files. Work with court system in regards to bankruptcy and tuition payments. 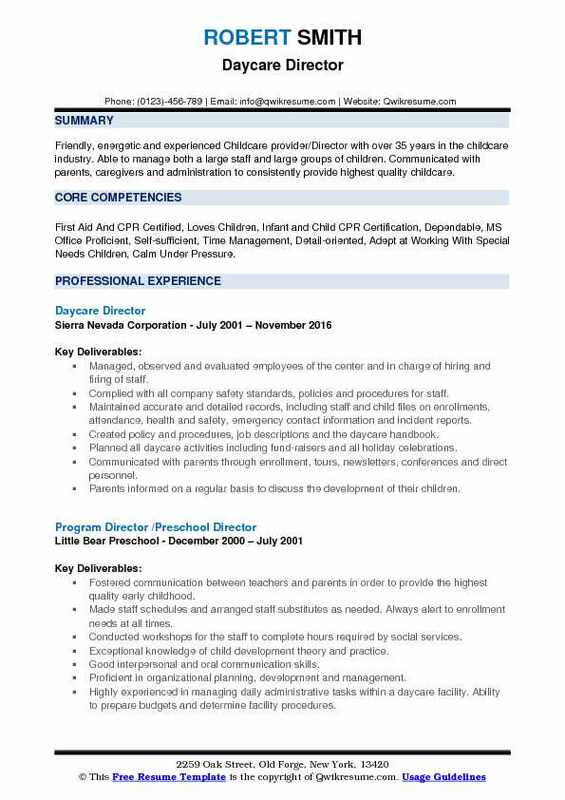 Summary : To obtain a position in the childcare field that allows for growth, success, and prosperity. I offer personality, dedication, and management experience. 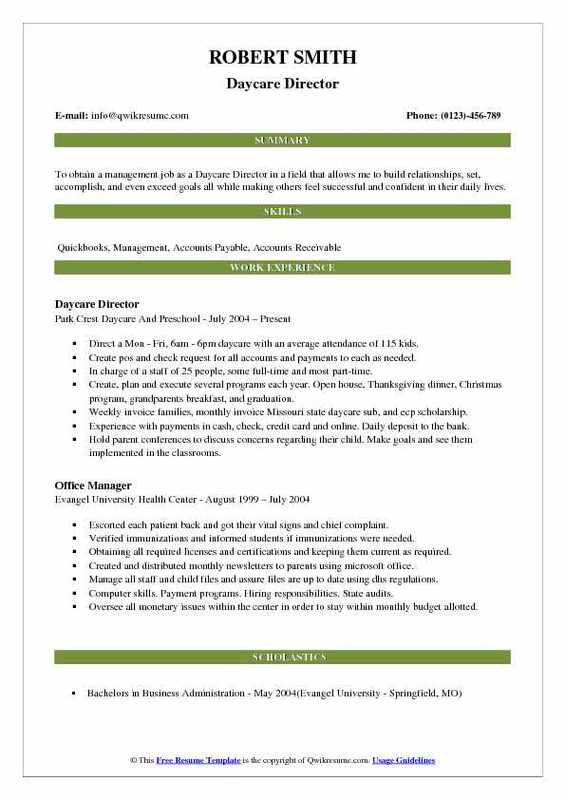 Skills : Microsoft Office, Training, Quickbooks, Child Care. To provide leadership in the development, implementation and evaluation of the before and after school program for the benefit of the systems total child care program. The primary responsibility is ensuring the safety and supervision of all children. Program management - provides effective leadership in developing comprehensive program plans, implementing and evaluating the planned programs. Fiscal management - prepares budgets, coordinates with other departments of agencies to assure maximum services, and maintains records, reports/ inventories in accordance with local policies. Information management - shares information about the program with various publics and serves as a liaison between the school system and other agencies. The director accomplishes personal growth objectives and demonstrates professional ethics at all times. Personnel management - assists in the selection and placement of personnel, delegates and supervises staff responsibilities and assists in evaluation staff. Instructional assistance - plan, and organizing, evaluating instructional and play activities, developing operational procedures and preparing necessary materials. Involved in activities to improve the total child care program and assist the lead teacher in ensuring a safe and healthful environment. General assistance- works to communicate the needs of the school and children, assists students with the understanding of rules and regulations, assists in maintaining cleanliness and neatness, and conducts themselves as a positive role model. 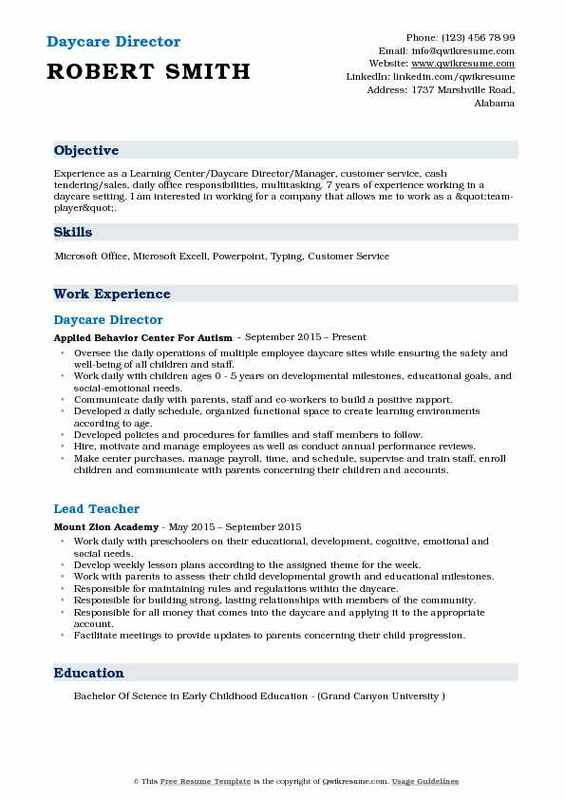 Objective : Experience as a Learning Center/Daycare Director/Manager, customer service, cash tendering/sales, daily office responsibilities, multitasking. 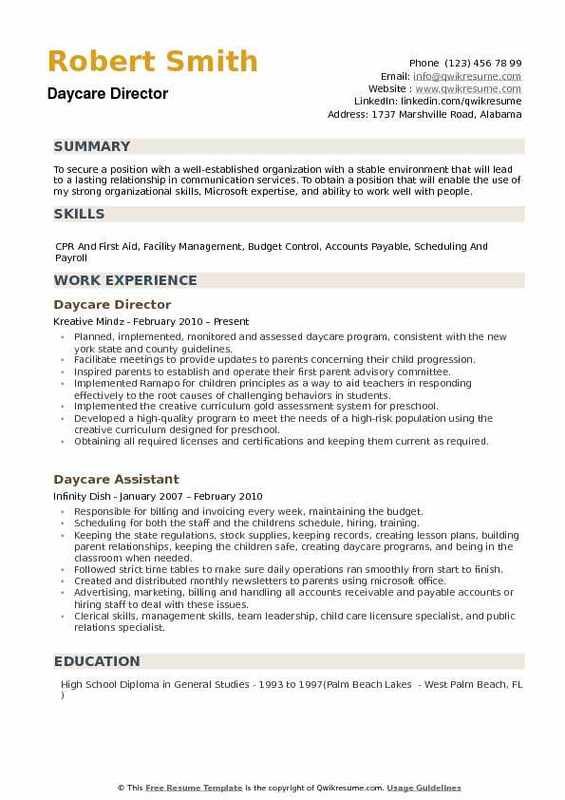 7 years of experience working in a daycare setting. I am interested in working for a company that allows me to work as a "team-player". Oversee the daily operations of multiple employee daycare sites while ensuring the safety and well-being of all children and staff. Work daily with children ages 0 - 5 years on developmental milestones, educational goals, and social-emotional needs. Communicate daily with parents, staff and co-workers to build a positive rapport. Developed a daily schedule, organized functional space to create learning environments according to age. Developed policies and procedures for families and staff members to follow. Hire, motivate and manage employees as well as conduct annual performance reviews. Make center purchases, manage payroll, time, and schedule, supervise and train staff, enroll children and communicate with parents concerning their children and accounts. Implement federal and state laws for daycare, manage daily building and grounds safety. Summary : An accomplished Administrative Professional with experience and success working in fast paced environments demanding strong organizational, technical, and interpersonal skills at senior management level. A proven track record meeting deadlines, multi-tasking efficiently, providing support for complex and time sensitive projects, and customer service resolutions. .. 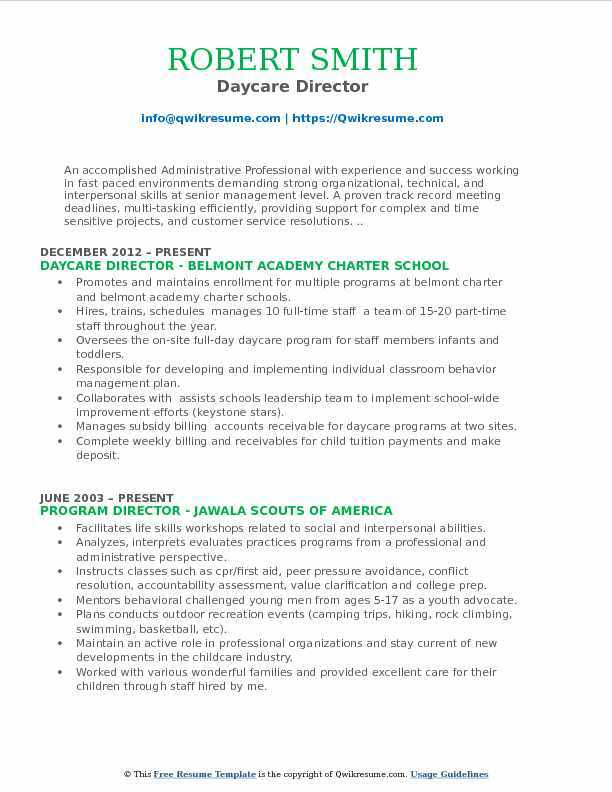 Promotes and maintains enrollment for multiple programs at belmont charter and belmont academy charter schools. Hires, trains, schedules manages 10 full-time staff a team of 15-20 part-time staff throughout the year. Oversees the on-site full-day daycare program for staff members infants and toddlers. Responsible for developing and implementing individual classroom behavior management plan. Collaborates with assists schools leadership team to implement school-wide improvement efforts (keystone stars). Manages subsidy billing accounts receivable for daycare programs at two sites. Complete weekly billing and receivables for child tuition payments and make deposit. Maintain childrens files in a secure manner according to state guidelines. Work with teachers to assure that all classrooms are safe, attractive and developmentally appropriate. 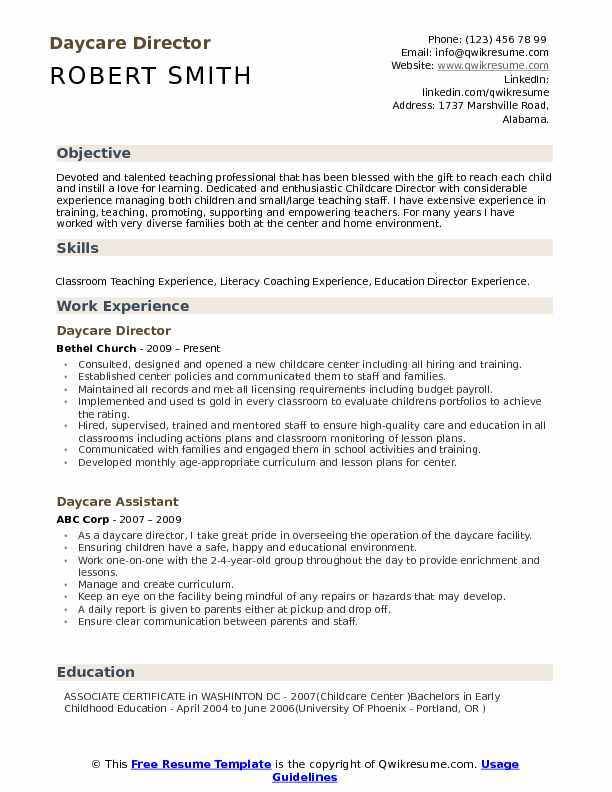 Summary : Experience Daycare Director with over 10+ years experience, who has exceptional competence in establishing and achieving personal and business goals. Dedicated, self-driven, focused, and results-oriented; always one step ahead of the challenge. Possesses a high degree of integrity and strong work ethic. Excellent coordinating skills. Skills : Staffing, Training, Childcare, CPR Certified, Social Work. Stay up to date with current and ever-changing NYS child care regulations. Interview, check qualifications/references, hire, and evaluate new staff. Plan and implement required staff training, fulfilling the ocfs requirement of 30 hours every 2 years. Organize children's schedules on a weekly basis and plan staff accordingly. Collect parent fees each week, make sure NYS DSS approval letters are current and renewals are. Oversee all monetary issues within the center in order to stay within the monthly budget allotted. Maintain an active role in professional organizations and stay current of new developments in the childcare industry. Review and evaluate new and current programs to determine their efficiency, effectiveness, and compliance with state, local, and federal regulations, and make necessary modifications. Create in-office training for staff and schedule and attend training from care about child care for myself and employees. Headline : I am currently working as a child care center director and my daily tasks involve management over 15 employees and supervision of 65 children. I handle all of the office and financial responsibilities of this company as well. I am experienced with office duties such as filing, computer programs, and tracking employee payroll. Determine the policies and regulations for running the daycare center. Extensive knowledge in providing counseling or therapy to mentally disturbed, delinquent, or handicapped children. Recordkeeping systems, forms control, office layout, and budgetary and personnel requirements. Ensure effective operation of childcare school as well as supervision of school staff. Implement curriculum and program philosophy; ensure facility maintenance, oversee all operational functions of the school. Work actively with teachers to maintain creative curriculum standards to maintain compliance with state regulations. Maintain a comfortable environment for parents to talk to staff which enables parent/teacher involvement. Create daily curriculum for each age group (including reading, math, science and social studies) while incorporating a multitude of outside materials. Summary : To secure a position with a well-established organization with a stable environment that will lead to a lasting relationship in communication services. To obtain a position that will enable the use of my strong organizational skills, Microsoft expertise, and ability to work well with people. Planned, implemented, monitored and assessed daycare program, consistent with the new york state and county guidelines. Facilitate meetings to provide updates to parents concerning their child progression. Inspired parents to establish and operate their first parent advisory committee. Implemented Ramapo for children principles as a way to aid teachers in responding effectively to the root causes of challenging behaviors in students. Implemented the creative curriculum gold assessment system for preschool. Developed a high-quality program to meet the needs of a high-risk population using the creative curriculum designed for preschool. Obtaining all required licenses and certifications and keeping them current as required. Promote the positive image of the company and play a major role in making the company a provider of choice in educational programs for the communities that we serve.